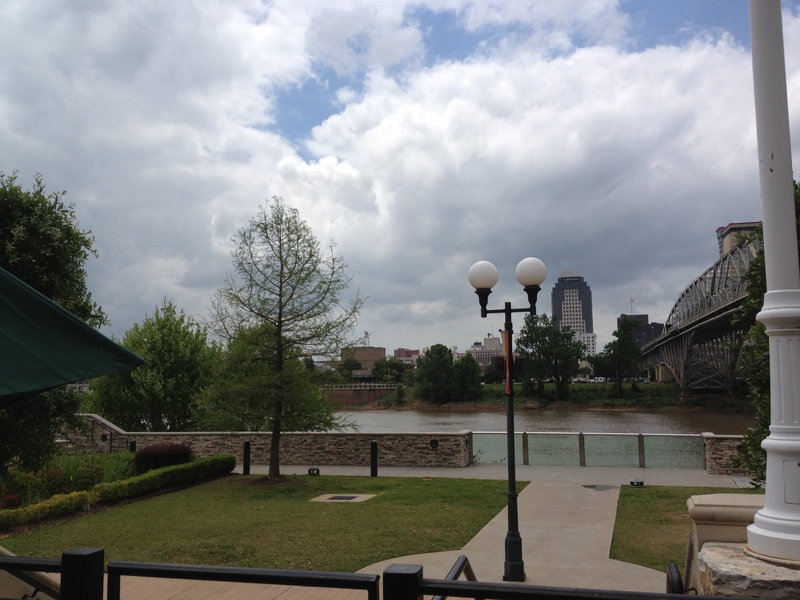 I recently returned from Shreveport after a brief visit. The original intention was for me to be a student in a Medic First Aid class so my husband could audit the instructor. If actual students showed I’d be off the hook, but being that they didn’t, it was all on me. Yes, I used to be a medic, so I figured I could daydream my way through the four hour class. That didn’t happen! The instructor was engaging and many times during the course I found myself actually performing tasks. Great tactic! If you want students to stay awake, make them do things. Because it can potentially save a life, let me boil down those four hours for you. First and foremost, GET HELP! CPR is very labor intensive and tiring. You want backup as soon as possible, plus having the trained guys on the scene allows the victim to get the care he/she needs that much quicker. Number Two: Make sure the scene is safe. It won’t help anyone if you become a victim, too. Number Three: Compressions are key for effective CPR. Even if you never perform one rescue breath, compress like the wind! Okay, more like compress to the beat of “Staying Alive” or for those with gallow’s humor, “Another One Bites the Dust”– mid-chest, and you should push down hard enough for the chest to sink in about two inches. You will hear and feel strange things. These are typical and should not stop you from performing CPR. 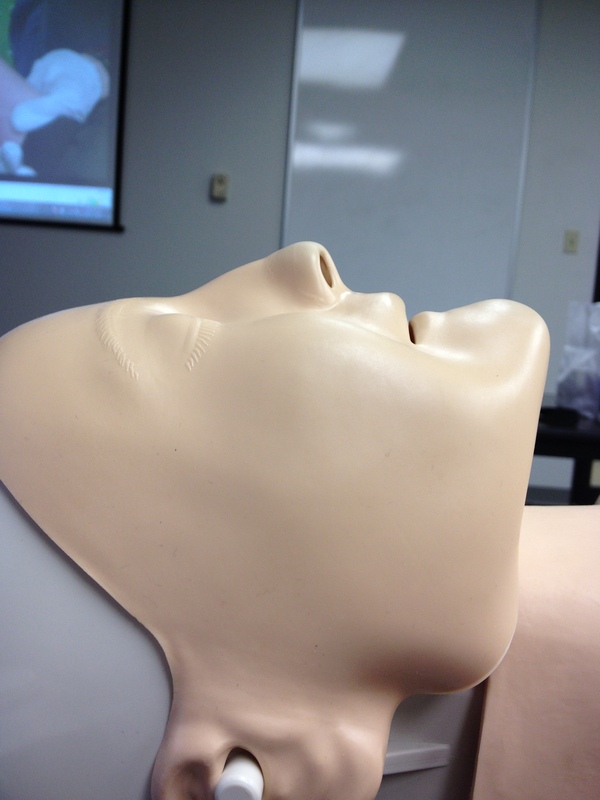 If you’re coordinated enough to give rescue breaths, give 2 breaths after 30 compressions. Make sure the chest rises and falls with each breath. P.S. Wear gloves and use a rescue shield if available. This equipment is considered PPE, Personal Protective Equipment–it helps to keeps the cooties a victim might have from getting on you. 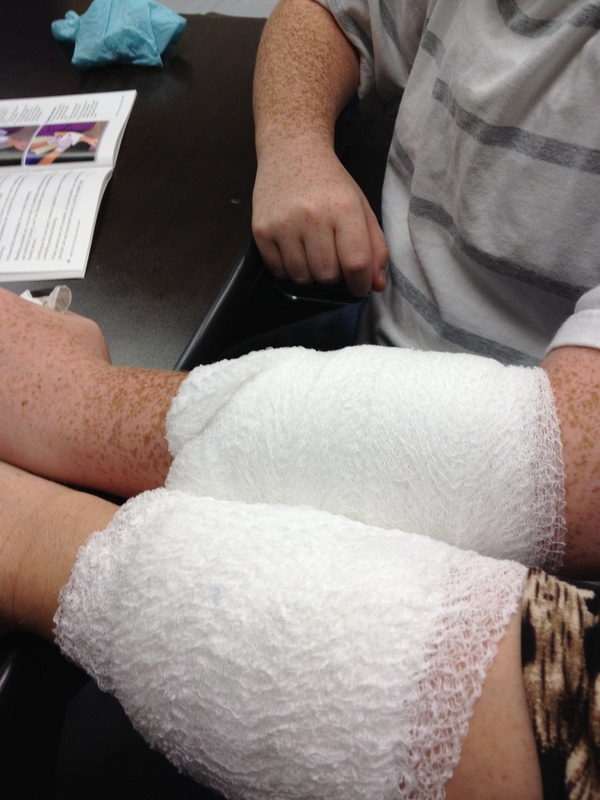 The bandaging open wounds section of the course. I’m not going to make this entire post about the first aid class. 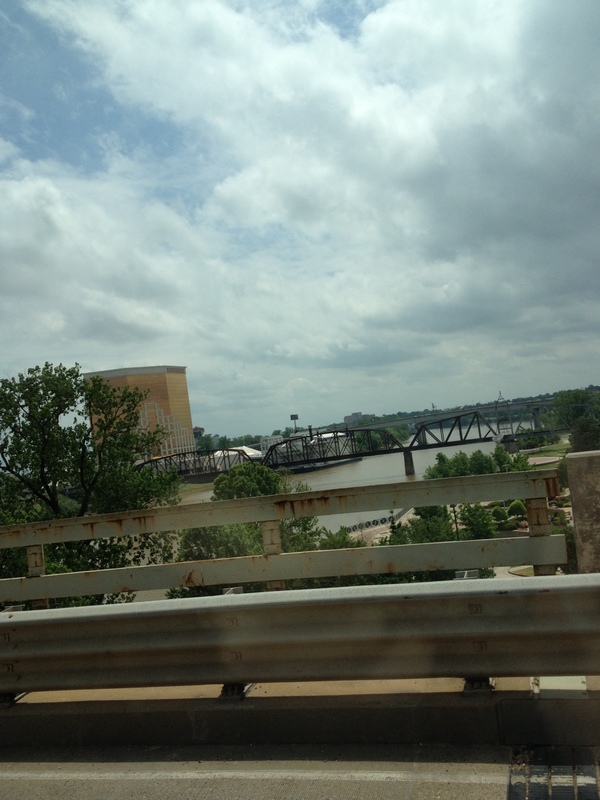 Shreveport/Bossier has become one of my favorite places to visit and it plays a part in a couple of my books, so let me show you around a little bit. 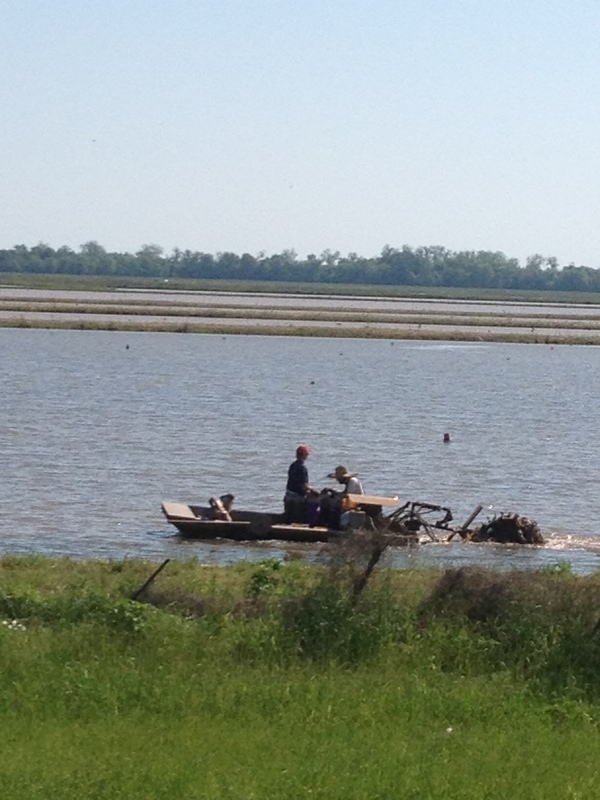 Crawfish are a Louisiana staple, so much so that ponds/empty rice fields are used to harvest enough to meet the demand. These ponds are generally quite shallow, so this boat has been modified to push them through the mud so they can empty their traps. Fans know that this is why the Green Bayou gang took their trip to Shreveport. 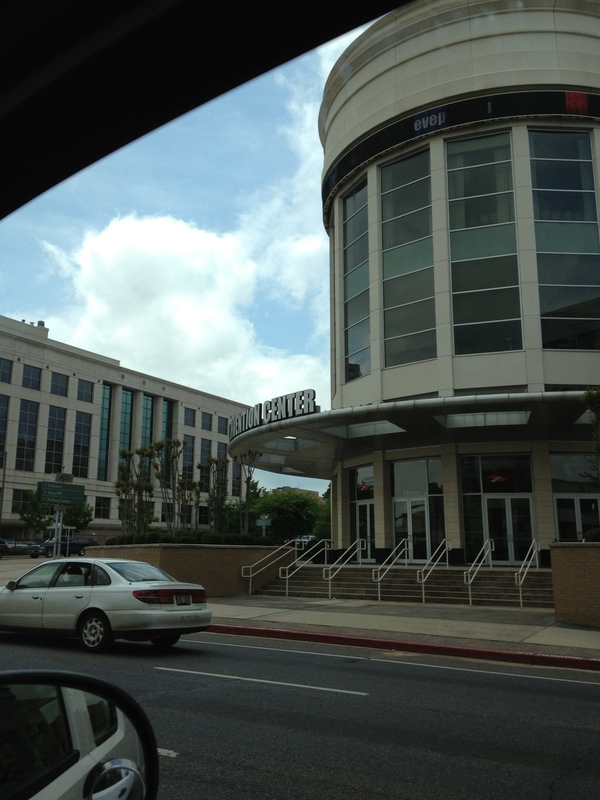 A not so great pic of the Shreveport Convention Center shows where Holden and Bert attended a law enforcement convention. This place is monstrous and located in the historic downtown, not too far from the Red River. The appropriately named Red River. Down in south Louisiana, our waterways are often a caramel brown. My personal joke is that if a gumbo is the color of Bayou Teche water, it’s good. Our water is filled with sediment so the water takes on the color of the dirt particles floating in it. In the delta region of Louisiana our dirt is dark brown/black. As you move north, the dirt becomes orangey-red. Thus, Shreveport’s Red River. Featuring a trolley, lots of shopping possibilities, several restaurants, and beautiful views, the Louisiana Boardwalk is a must see. The Louisiana Boardwalk has one of my favorite shops, Bath and Body Works, so after a nice lunch at Saltgrass Steakhouse my first stop was to restock my favorite fragrances. After perusing a few more shops we made our way to my husband’s favorite place, Bass Pro. He shopped and I played in the arcade. 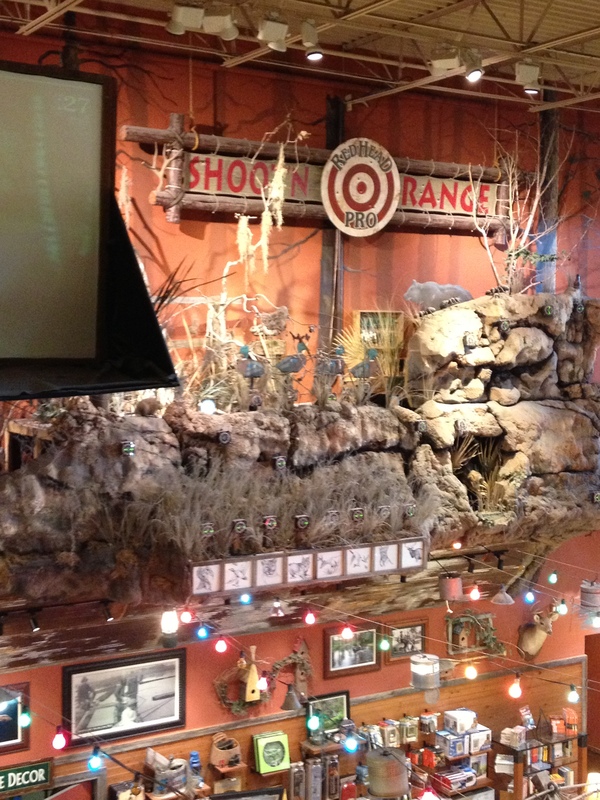 One of my favorite spots in Bass Pro. Another place that was mentioned in my books was Cross Lake. Jacob’s parents, Fred and Julia, owned a house on the spacious body of water. 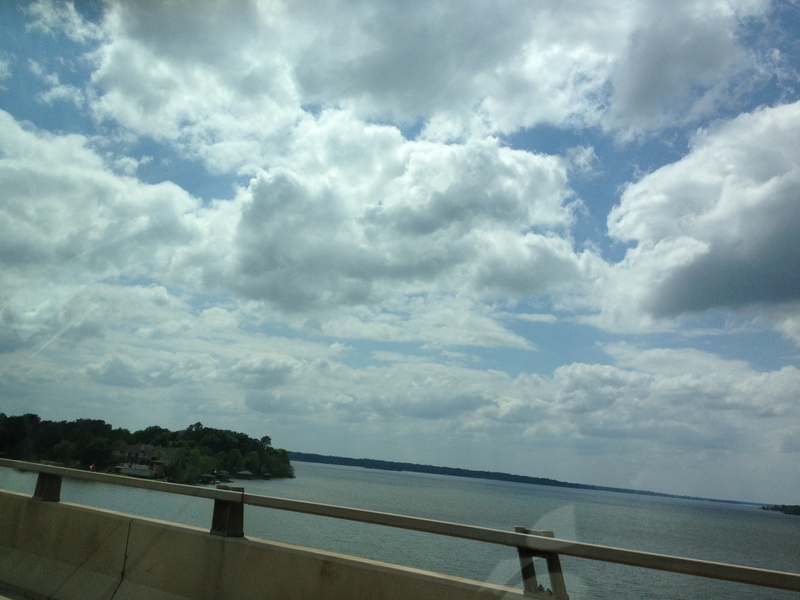 Here is a not so wonderful shot from the bridge as we crossed it. A quick shot of Cross Lake. 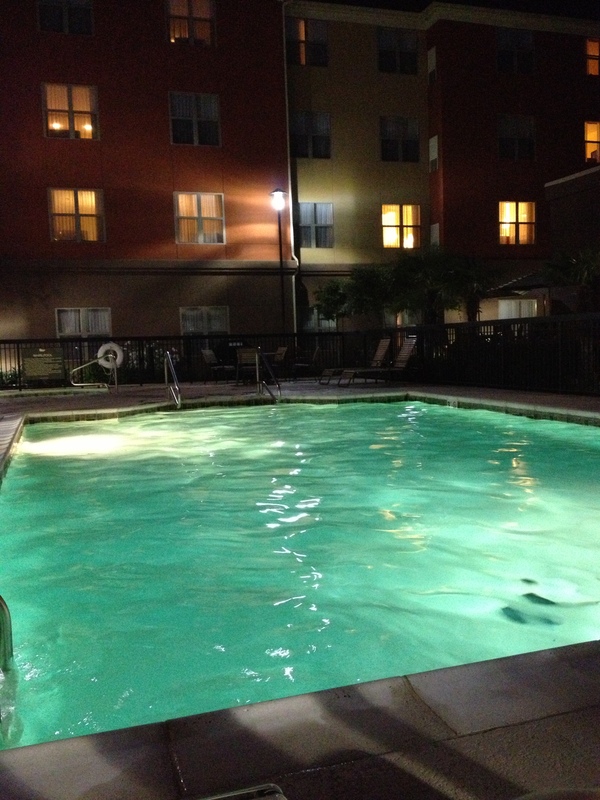 The Homewood Suites’ swimming pool at night. I won’t be clogging your social media with calls to vote. In my opinion, I’ve already won. The Green Bayou family is more amazing than I could ever hope for. When I first started writing, I remember telling myself that if I happened to entertain even one friend or family member, I would consider myself a success. Five and a half books and lots of fans later, I have far exceeded my goal. Though recognition via an award would be sweet, it’s not the true measure of my worth as a writer. Whenever someone tells me that they couldn’t put a book down, or that they jumped immediately from one book to another, or they gush about how realistic the characters are to them–that’s my award. I’m not sure if you guys know how much every kind word, and even the constructive criticism I’m occasionally given, means to me. So what it all boils down to is that I already know you enjoyed the novella, I already know that Green Bayou fans are the best, and I already know that writing this series has been the best chance I’ve ever taken in my life. It brought all of you into my world!! I’ll still go through with the giveaway and I’ll still post Chapter One of “Connie’s Wild Night”!!! If you would like to enter the contest for the giveaway at the Sparring Stepsisters, feel free to do so! I’ll let the contest continue until the end of the month, but here is the new deal. The prizes from me were a signed paperback to one person and a poster to another. I’ll double that, so there will now be four winners. One set of winners will be chosen from those who left the voting numbers and the second set will be chosen from those who comment who your favorite character is in the series. Now, go enjoy the lack of voting reminders in your newsfeed!! When I was approached by Melinda McGuire to contribute to the Rich Fabric anthology, I didn’t hesitate to accept! Though my knowledge of quilting was fairly limited, I opted to view my contribution as a personal challenge. Would I be capable of writing a heartfelt, entertaining, and informative piece about quilting? Well, I was going to give it my best shot! I interviewed some wonderful quilters and learned how closely tied their quilts were to some very real and powerful emotions. After realizing that quilting was much more than a skill, I remembered that my friend just so happened to quilt. Even though she didn’t belong to the quilting guild I visited, I went ahead and sent her the same questionnaire I gave to the rest of them. As I read through her answers, I knew that she had more to contribute than a random quote here or there. She offered a glimpse inside her soul when she detailed how quilting had literally changed her life. Her story deserved to be heard, so I talked to Melinda, and she graciously agreed to allow Crystal to contribute, as well. After Crystal turned in her contribution, I thought it would be the end of our working relationship. One day I received a message that she was writing a story, so naturally, I asked her if I could read it. My friend, who was already a gifted quilter, painter, scholar, historian, chef, etc., was also one heck of a storyteller! At first, she was embarrassed and shy to show me her work, but after some encouragement, she was sending me things to read on a daily basis! She became more and more confident, so much to the point that she published her work online for others to read. I really enjoyed our talks about writing and publishing. I sure do miss those messages. I still find myself checking Facebook or my email hoping to find a note or a section of story from her. I know they aren’t going to come, but I still wish for them. I miss my friend. She tragically and unexpectedly left this world at the young age of thirty-five on September 4th of this year. Though she often experienced tragedy and difficulties, I know that if I were able to ask Crystal for one word to describe her life, she’d likely say “rich”. She was rich in the love she gave, in the love she received, in the trueness of her friendships, in her compassion for others and the compassion she received. She was rich with copious amounts of knowledge and pride in her heritage. She was rich because she had a job that she loved and hobbies that she not only enjoyed, but excelled at. The title of the anthology, “Rich Fabric” seems fitting when it comes to Crystal’s life. She was the fabric that held so many people together and our lives were made so much richer through knowing her. Even though she has passed on, you as a reader will have the opportunity to get to know this special woman through her contribution. I hope you will embrace and enjoy this gift from Crystal! Southern Creatives – News from the Road – Humble, TX. Bookstores + Brownies = Best Things in Life.